Subover is a Hostile Subdomain Takeover tool designed in Python. From start, it has been aimed with speed and efficiency in mind. Till date, SubOver detects 36 services which is much more than any other tool out there. The tool is multithreaded and hence delivers good speed. 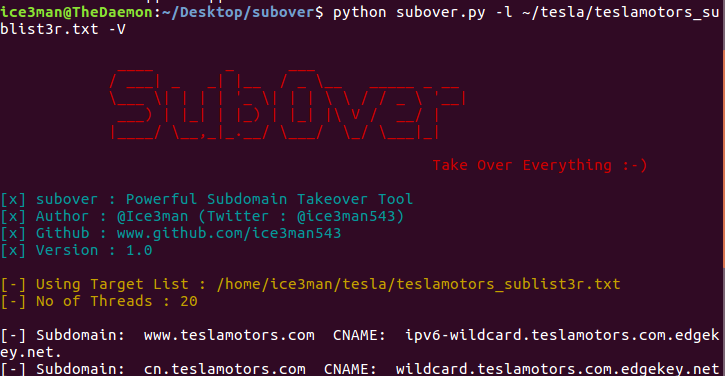 It can easily detect and report potential subdomain takeovers that exist. The list of potentially hijackable services is very comprehensive and it is what makes this tool so powerful. -l subdomains.txt is the list of target subdomains. These can be discovered using various tool such as sublist3r or others. Q: What should my wordlist look like? Show me how to do it better.